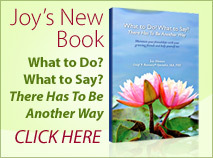 Joy's unique perspective has given me new insights into dealing with others experiencing grief and my own personal losses. This should be required reading for physicians, psychologists, social workers, and anyone who works with people who have experienced the death of someone they love. Joy Abram's Empowerment Sessions have made me more conscious of patterns I have and how to stop them and move beyond them. This has given me momentum to move toward my true goals at a speed I would not have had before working with her. Joy has been light years ahead of her time, all of her life. Joy began teaching yoga before most of us in the West even knew what it meant - the union of body, mind and spirit. Spirituality being an integral axis of the yogic way, Joy's teachings remain true. Nutritional remedies in priority to pharmaceutical fixes, always a mainstay of her foundational teachings regarding health. Joy's in depth study of Feng Shui Mastery came long before many of us could even correctly utter the words. Addressing the natural progression of healing the body itself, to the body's space through the Feng Shui - art of place. Uplifting our work and living spaces through upping the unseen energy currents all around, and part of us. The subtle and effective energetics of Reiki, yet again, another of her enlightening tools. Removing all manner of blockages in the mental, emotional, physical, and spiritual bodies within and of us all. Each of these tools designed to address every facet of healing a Human Being could know. Joy's Empowering Teachings have been a potent impact upon my life in the most benevolent ways. Quite literally my life has changed course for the betterment. In addition, I have witnessed her transformations in the lives of many others. Empowerment indeed. Quite simply - her stuff works!